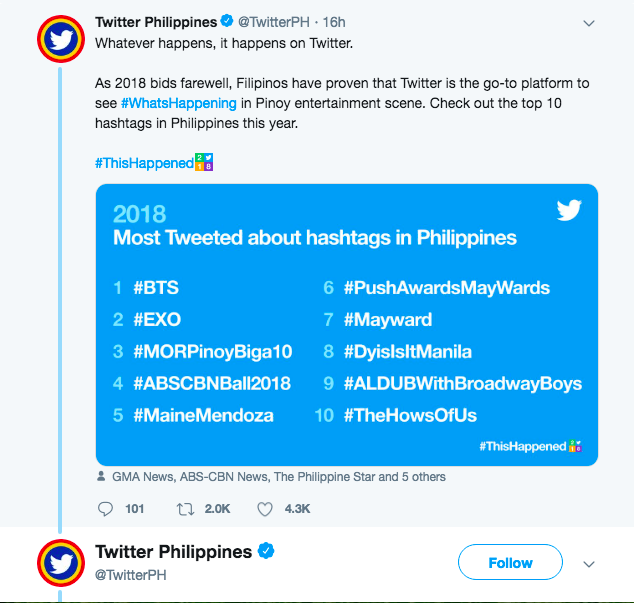 MANILA — According to Twitter’s year-end data, Maine Mendoza was named as the most tweeted Filipino celebrity for 2018. Her very busy career this year has created high Twitter engagement. This includes the launch of her new comedy series in GMA “Daddy’s Girl in the City” with Vic Sotto and the release of her lipstick collaboration with MAC Cosmetics which was sold out online in just one minute. Taking the second spot is Kapamilya’s Maymay Entrata who also had a remarkable year as she made history by being the first Filipina to walk at the Arab Fashion Week.